We made a goal at the beginning of the school year, to pray and read scriptures together as a family every morning. We've been doing pretty well and I'm happy with how well we've been sticking with it. One of the things I have liked about it is that Katrina has become more and more comfortable with reading from the scriptures. I think it's great for children to have the opportunity to read from the scriptures even when they're young and don't understand all of the vocabulary. It's a great opportunity for us, as parents, to stop and explain what things mean (teaching them about words and about the contents of the scriptures). It also helps them to become familiar with the language used in the scriptures so that as they grow older, it will not feel foreign to them. 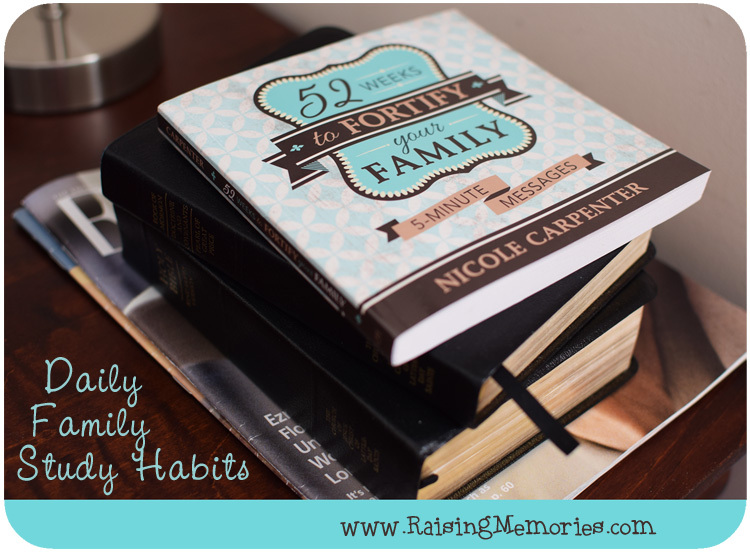 I had the opportunity recently to review Nicole Carpenter's new book, 52 Weeks to Fortify Your Family. This is a book full of weekly themes that includes an entire year of quick and powerful daily devotionals using scripture from the Bible and the Book of Mormon. Each weekly theme includes scriptures, quotes, thoughtful questions, and references to conference talks that relate to it. 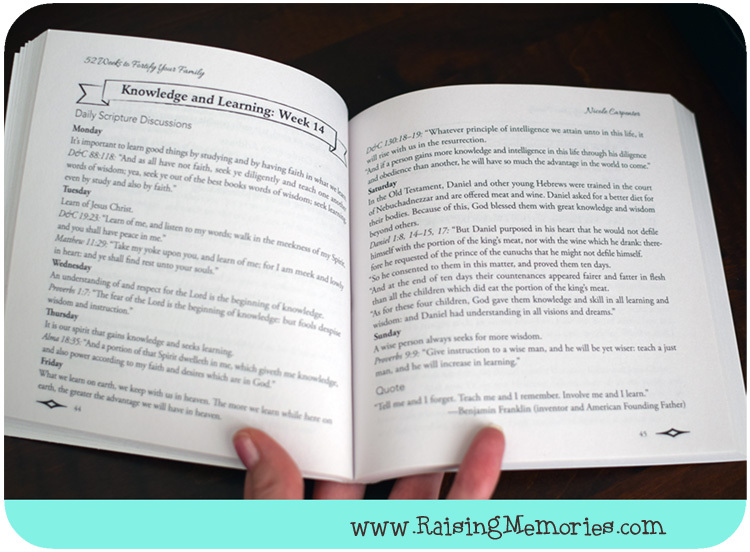 If you want to study the scriptures by topic or to focus each week as a family on a particular area or goal, this is an awesome way to get started without having to put a ton of time and preparation in, just to get going! You can also enter to win a free copy of your own by filling out this entry form! My family attends our Sunday School, but I would really love to have a little family bible study during the week. I feel like we need an anchor during the week to help us stay on track. That's a good word for it (anchor). It really does seem to make a big difference if you can get that moment in each day! My mom always did weekly devotions with us when we were kids. Now, I'm doing it with my daughter as part of her schoolwork. We also try to pray together as a family every night and when we can, go to daily Mass (now that we live within walking distance of a church!). I agree that it's important to read the Bible even before kids can understand all the hard words; I think they understand more than we think they do, and they learn a lot from it either way. :) Thanks for sharing! I agree. It's great to have that discussion together as a family and to help each other to understand things! Looks like a great book for families who want to strengthen their faith together! I think it would be such a helpful tool for parents! Thanks for sharing! Happy Valentine's Day! I would love to make it through the Bible this year. I haven't read it in it's entirety since college and it's time I do it again! It is a pretty huge undertaking! This looks like a great scripture study resource! I love the idea! What a lovely book! Such a great way to share some important moments with your kids and help them to have a better understanding. We're not a religious family but I like the idea of having a morning routine that the family does together! For us, it's just breakfast all together and a chat. Breakfast together is such a great way to start the day! We seem to be all over the place in the morning once we get to breakfast- I would love to get better at that! My goal is to have more time together as a family. We are usually together but distracted with TV, computer, etc. So i think quality time through walks and games would be great. This is a nice book for the family! I really stink at having daily scripture study, but my 7-year-old daughter loves to remind me. She's such a great helper! She just got a new set of scriptures from my parents for her birthday, so she's excited to use them. My husband's a nonmember, so it's just her and I, but I'd like to get into a good spiritual routine and be a better example for her! We read the scriptures every night as a family. Each morning I try to have a short devotional with my kids before they go to school. This book looks like a great tool to aide with our morning devotionals. Thanks!